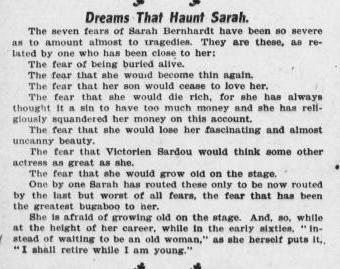 If you’re looking for biographical information on Sarah, there is no shortage of it out there. 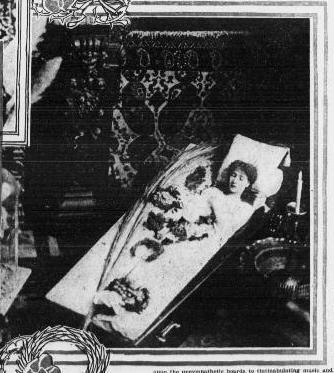 Born in France in 1844, she was considered to be one of the world’s greatest dramatic actresses of her time, and her eccentricities surely fueled her notoriety. 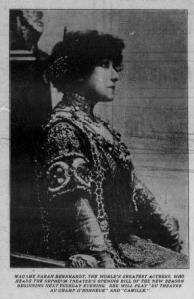 Some of those “quirks” (as reported in the historic newspapers) are the focus of this post. 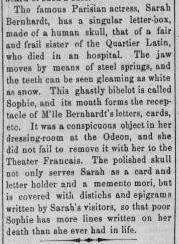 In 1879, fellow actress Mary Anderson touched on the subject of Sarah’s coffin as well as some other peculiarities about the star. 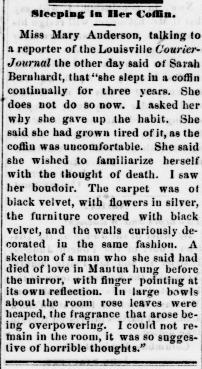 While Mary Anderson thought Sarah’s interior decorating skills were macabre, I think they sounded divine. 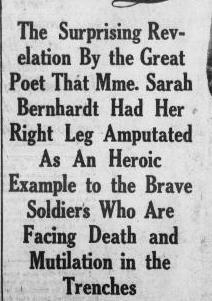 The same year of the surgery, the Omaha Daily Bee ran an article about Bernhardt, including an assertion by poet Edmond Rostand that she’d elected to undergo the amputation out of empathy for the soldiers who were being killed and mutilated during the war. 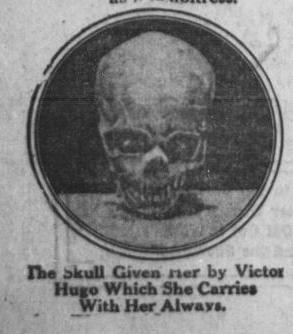 The Omaha Daily Bee also printed a composite image of what Sarah’s prosthetic leg might have looked like and a skull gifted to her by Victor Hugo. 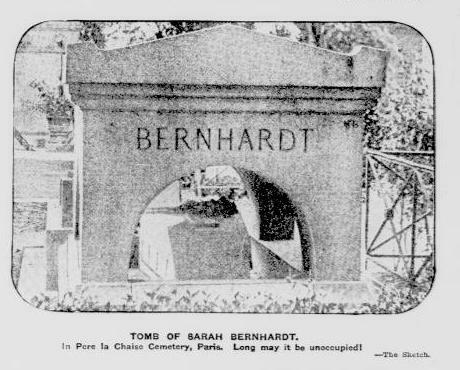 While Sarah didn’t die until 1923 from uremic poisoning, she had her tomb built many years before her demise in Paris’ Cimetière du Père Lachaise. 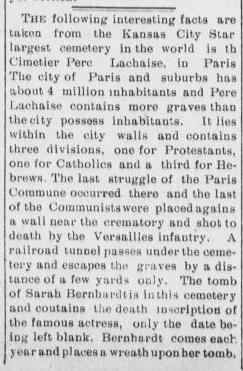 Reports of the tomb existed as early as 1889. 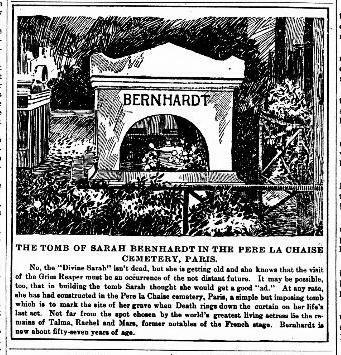 Sarah allegedly made an annual visit to the tomb to adorn it with a wreath. I suppose that if I spent the money to erect such a monument, I would probably visit it too, if nothing else to reflect on life…and death, of course. One more detail about Sarah that isn't quite as macabre, but still pretty good: She once played Judas. Who was the hero of the play. Who was also Mary Magdalene's lover until Mary cheated on Judas with Jesus. Which inspired Judas to betray Jesus to the Romans. Yeah, that play went over about as well in 1910 as you'd think.